According to a new national survey from Ottawa-based Abacus Data, a majority of Canadians back restrictions on smoking on patios before 8pm and in parks and public beaches. Nationally, 61% of Canadians surveyed said they either strongly (47%) or somewhat (14%) support a law that would restrict smoking on outdoor patios before 8pm while 25% opposed the proposed measure. 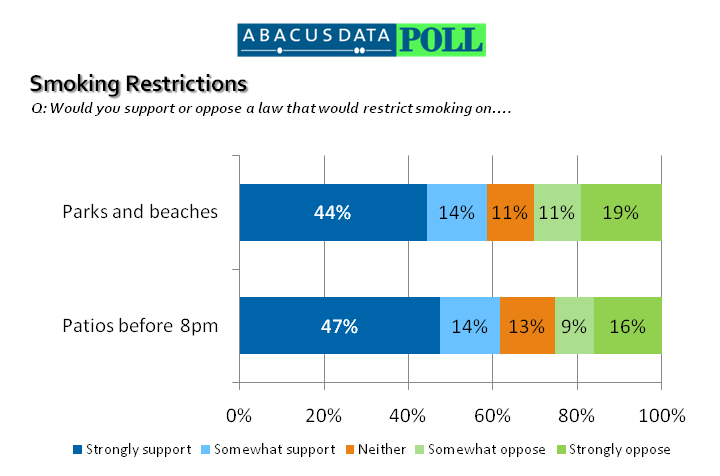 Similarly, 58% of Canadians said they either strongly (44%) or somewhat (14%) support a law that would restrict smoking in all public parks and beaches while 30% opposed the idea. Regionally, support for such restrictions is highest in Manitoba and Saskatchewan, BC, Atlantic Canada, and Ontario while lowest in Quebec and Alberta.